The carrier-based E-2C warns of approaching air threats and passes data to fighter aircraft such as F-14 Tomcats. The E-2C Hawkeye has a distinctive 24ft diameter radome above the rear fuselage. The E-2C has an operating altitude above 25,000ft. The radome houses an antenna that rotates at 6rpm. The AN / APS-145 radar is capable of tracking more than 2,000 targets and controlling the interception of 40 hostile targets at ranges over 550km. With the new engines, the E-2C can cruise on station for more than four hours, up to 200 miles from base. Secondary roles of the E-2C Hawkeye include strike command and control, surveillance as well as guidance of search and rescue missions. For storage in the hangar the wings fold hydraulically to lie flat to the fuselage. The E-2C Hawkeye airborne early-warning aircraft is in service with the US Navy and six other countries. From an operating altitude above 25,000ft, the Hawkeye warns the naval task force of approaching air threats and provides threat identification and positional data to fighter aircraft such as F-14 Tomcats. Secondary roles include strike command and control, surveillance, guidance of search and rescue missions and as a relay to extend the range of communications. 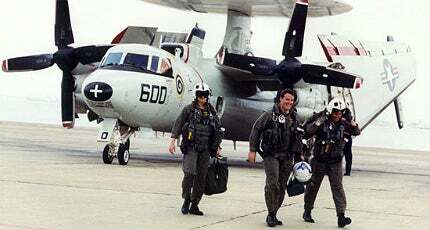 The E-2C became operational in 1973. The Block II aircraft, featuring improved engine and radar, entered service in 1992 with final delivery taking place in 2001. As well as the US Navy (USN), the E-2C aircraft are in service with the navies of Egypt, France, Israel, Japan, Singapore and Taiwan. Three ex-Israeli Air Force E-2C aircraft have been sold to the Mexican Navy, with the first two delivered in June 2004 and the third in November 2004. Deliveries have totalled more than 180 for the USN and more than 30 for other nations. Six E-2C Hawkeye aircraft are deployed by the US Naval Reserve for drug interdiction and homeland security operations. "The E-2C Hawkeye is an all-weather, airborne early-warning aircraft." The fuselage is designed for carrier operations and is fitted with a nose-tow catapult attachment for accelerated carrier take-off, an A-frame arrester hook for engagement of the arresting gear and a tail bumper to withstand impact or scraping on the runway. For storage in the hangar, the wings fold hydraulically to lie flat to the fuselage. The fuselage is made of light metal and parts of the tailplane are of composite structure, in order to reduce radar signature. From May 2004, US Navy Hawkeye 2000 aircraft are being fitted with two Hamilton Sundstrand NP2000 eight-bladed, digitally controlled propellers to replace mechanically controlled, four-bladed propellers. The new propellers provide less vibration and less noise. Initial carrier certification of the new propellers was carried out on USS John F Kennedy in November 2003. The large, 24ft diameter circular antenna radome above the rear fuselage gives the E-2C its distinctive profile. The radome houses the AN/APA-171 antenna supplied by Randtron Systems, which rotates at 5rpm to 6rpm. The Lockheed Martin AN/APS-145 radar is capable of tracking more than 2,000 targets and controlling the interception of 40 hostile targets. One radar sweep covers six million cubic miles. The radar’s total radiation aperture control antenna reduces sidelobes and is robust against electronic countermeasures. It is capable of detecting aircraft at ranges greater than 550km. The Lockheed Martin AN / UYQ-70 advanced display system and computer peripherals provide operators with multicolour displays, map overlays, zoom facilities and auxiliary data displays. In August 2005, Northrop Grumman completed the E-2C mission computer replacement programme, with the provision of faster, more powerful and reliable computers. A global positioning system and a Northrop Grumman (formerly Litton) AN / ASN-92 CAINS (carrier aircraft inertial navigation system) are the main components of the aircraft’s navigation suite. The aircraft is also equipped with the AN / ASN-50 heading and attitude reference system, an AN/ARA-50 UHF automatic direction finder from Rockwell Collins, an AN / ASW-25B automatic carrier landing system and a Honeywell AN / APN-171(V) radar altimeter. The communications suite includes an AN / ARC-158 UHF data link, an AN / ARQ-34 HF datalink and a joint tactical information distribution system (JTIDS), which provides secure voice and data communications. The E-2C was originally fitted with two Allison T56-A-425 turboprop engines, but since the introduction of E-2C Group I variants, T56A-427 engines rated at 3,800kW of output power have been fitted. With the new engines, the E-2C can cruise on station for more than 4h, up to 200 miles from base. The first of the Hawkeye 2000 (HE2K) standard aircraft, was delivered in October 2001. A total of 21 aircraft were ordered by the USN and the final production aircraft was delivered in September 2009. "The Hawkeye 2000 made its first operational deployment in 2003 aboard USS Nimitz." The Hawkeye 2000 made its first operational deployment in 2003 aboard USS Nimitz (CVN 68) in support of Operation Iraqi Freedom. Northrop Grumman is also upgrading a number of USN aircraft to Hawkeye 2000 configuration. One aircraft has been delivered to the French Navy for operation on the Charles de Gaulle carrier and two E-2Cs already delivered have been upgraded to the 2000 standard. In April 2007, France requested the foreign military sale (FMS) of an additional aircraft. The French government requested an FMS with the US Government in October 2011 for upgrade of four E-2C Hawkeye at a cost of $180m. Northrop Grumman is the prime contractor in the upgrade programme. The upgrade work includes integration of weapon systems, sensors, Mode 5/S identification friend of foe, five APX-122 IFF Mode 5/S interrogator systems, five APX-123 IFF Mode 5/S transponder systems and five ALQ-217 electronic support measure systems. Two Hawkeye 2000 aircraft were delivered to Taiwan in 2004/2005 to join their fleet of four E-2Cs. The designated E-2K aircraft entered service in April 2006. Egypt has upgraded its five E-2C Hawkeye aircraft to Hawkeye 2000 standard and has received one additional upgraded E-2C. The first upgraded aircraft was delivered in March 2003 and deliveries concluded in October 2008. Egypt requested two additional excess E-2C aircraft in October 2007. The Japanese Air Self-Defence Force is also upgrading its 13 Hawkeye aircraft with the first being delivered in early 2005. In December 2007, the UAE requested the sale of three upgraded E-2C aircraft. Hawkeye 2000 features a Raytheon mission computer upgrade (MCU), a Lockheed Martin advanced control indicator set (ACIS), cooperative engagement capabilities (CEC), satellite communications, new navigation and flight control systems. The MCU is based on open architecture commercial off-the-shelf (COTS) technology with increased memory and faster processing. The CEC consists of processor, data distribution system and antenna and enables Hawkeye 2000 to perform real-time battle management, fusing and distributing information from sources such as satellite and shipborne radar. The next-generation, E-2D Advanced Hawkeye has a new radar system, theatre missile defence capabilities, multi-sensor integration and a Northrop Grumman Navigation Systems tactical glass cockpit. Lockheed Martin Maritime Systems & Sensors has developed the AN / APY-9 solid-state, electronically steered UHF radar under the E-2C radar modernisation programme. Northrop Grumman supplies the transmitter, Raytheon the receiver, L-3 Communications Randtron the UHF antenna and BAE Systems CNIR the identification friend or foe system. "E-2C Hawkeye became operational in 1973." The Advanced Hawkeye will replace all 75 USN E-2C aircraft. The aircraft began full system development and demonstration (SDD) in August 2003 and July 2007, and Northrop Grumman was awarded a pilot production contract for three aircraft for delivery in 2010. The E-2D was rolled out in May 2007 and made its maiden flight in August 2007. Operational assessment was completed in November 2008 followed by transfer to US Navy Patuxent River, Maryland, for carrier testing and sea trials. The first E-2D was delivered to the US Navy in July 2010. A successful launch of the E-2D using the electromagnetic aircraft launch system (EMALS) prototype took place in September 2011. Initial operational capability was achieved in October 2014. In June 2009, the US Navy awarded a $432m low-rate production contract for four aircraft. The first E-2D Advanced Hawkeye production aircraft was delivered to the US Navy in July 2010. The aircraft completed the first carrier landing on the USS Harry S Truman (CVN 75) in February 2011. In April 2011, US Naval Air Systems Command placed a $94.6m modification contract for low-rate initial production of four E-2D aircraft. The US Navy awarded a $795m contract to Northrop Grumman Corporation in August 2011 to design, manufacture and supply five LRIP E-2D Hawkeye aircraft, as well as long lead materials. The Indian Navy is in discussions with Northrop Grumman for six aircraft, which was approved by the US Government in August 2009. Northrop Grumman received a $617m contract from the US Navy in August 2013 to manufacture and deliver five E-2D Advanced Hawkeye aircraft under Lot 1. The US Navy placed a $226.7m contract for an in-flight refuelling system in January 2014. The preliminary design review of the aerial refuelling system was conducted in September 2014. The in-flight refuelling capability will extend mission endurance by up to nine hours. In June 2014, Northrop Grumman was awarded a $3.6bn multi-year contract to deliver 25 new E-2D Advanced Hawkeye aircraft for the US Navy. The Eurocopter HH-65 Dolphin is a twin-engine search and rescue (SAR) helicopter in service with the US Coast Guard (USCG). MCH-101 is an Airborne Mine Countermeasures (AMCM) and transport helicopter, operated by the Japan Maritime Self Defence Force (JMSDF).